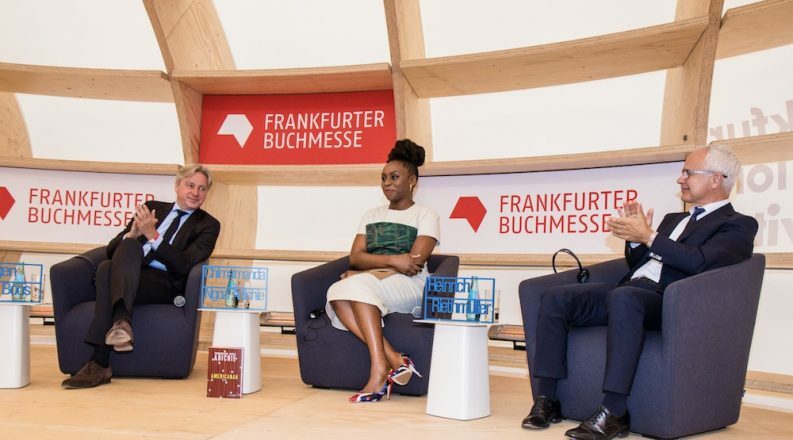 Delivering a rousing talk at the Frankfurt Book Fair’s opening press conference, author Chimamanda Ngozi Adichie spoke about the strength of literature and women. The Nigerian novelist Chimamanda Ngozi Adichie was given a rock star’s welcome at the fair’s opening press conference yesterday—entirely appropriate for a writer whose work has been sampled by Beyoncé—with extended applause and cheers and an almost palpable outpouring of affection. She did not disappoint, and in a wide-ranging speech that touched on women’s rights and the importance of writing, she said that the world was “shifting and darkening . . . the most powerful country in the world feels like a feudal court, full of intrigue, of mendacity, drowning in its own hubris.” As everyone hoped she would, she made direct reference to the appointment of Brett Kavanaugh to the US Supreme Court, despite allegations of sexual misconduct made by two women. Read more from Frankfurt in our Wednesday Show Daily.